Your chance to get on set! 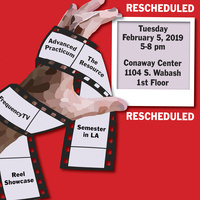 Learn more at the Salon about Advanced Practicum, The Resource, FrequencyTV, The Reel Showcase and Semester in LA opportunities. Open to ALL students at Columbia College Chicago.